The letter to the bank below is an actual letter that was sent to a bank by a 96 year old woman The bank manager thought it amusing enough to have it published in the New York Times. I am writing to thank you for bouncing my check with which I endeavored to pay my plumber last month. By my calculations, three nanoseconds must have elapsed between his presenting the check and the arrival in my account of the funds needed to honor it. I refer, of course, to the automatic monthly deposit of my entire salary, an arrangement which, I admit, has been in place for only eight years. You are to be commended for seizing that brief window of opportunity, and also for debiting my account $30 by way of penalty for the inconvenience caused to your bank. My thankfulness springs from the manner in which this incident has caused me to rethink my errant financial ways. I noticed that whereas I personally attend to your telephone calls and letters, when I try to contact you, I am confronted by the impersonal, overcharging, pre-recorded, faceless entity which your bank has become. Let me level the playing field even further. When you call me, press buttons as follows: 1. To make an appointment to see me. 2. To query a missing payment. 3. To transfer the call to my living room in case I am there. 4. To transfer the call to my bedroom in case I am sleeping. 5. To transfer the call to my toilet in case I am attending to nature. 6. To transfer the call to my mobile phone if I am not at home. 7. To leave a message on my computer, a password to access my computer is required. Password will be communicated to you at a later date to the Authorized Contact. 8 To return to the main menu and to listen to options 1 through 7. 9. To make a general complaint or inquiry. The contact will then be put on hold, pending the attention of my automated answering service. While this may, on occasion, involve a lengthy wait, uplifting music will play for the duration of the call. Regrettably, but again following your example, I must also levy an establishment fee to cover the setting up of this new arrangement. Editors Note: The above is an endearing letter from a senior citizen and it was quite charming that the bank manager took this so "seriously" that he thought to "have it published in the New York Times," but the fact remains, bounced check charges amount to an $18 billion covert annual business for the Federal Reserve member banks -- at your expense and inspite of your inconvenience. See The Insufficient Funds Racket at http://www.jaegerresearchinstitute.org/articles/racket.htm to learn exactly how the racket works and how it negatively effects society and commerce. Feel free to forward this communication to anyone you know who has a checking account with a bank. Most of us have a checking account and most of us have, at one time or another, been in trouble with one -- even Congressmen. But some of the new "insufficient funds," "unavailable funds" and "uncollected funds" charges that are levied on customers' accounts are not only confusing and excessive, but possibly not in the best interest of commerce or society. After having some experience with the Federal Reserve Member Banks' arcane, predatory policies and non-standard fiscal days in this area -- I would like to shed some light on a business practice I believe needs to be voluntarily changed by the banks, or addressed by class action. First of all let me say this article is not meant to target or invalidate any of the many good services banks provide -- or ethical bankers, several of which I have had the pleasure of working with in the past, and one, a manager, who confirms the premise of what you are about to read. Clearly not all banks have mercenary or predatory service policies, but again, the ones that do, and the ones that are taking advantage of their customers and the public, especially elderly and young depositors, need to be addressed(1). When a bank customer issues a check and there are insufficient funds in his (or her) account (or uncollected funds not-yet in his account), the bank either RETURNS the check (known as "bounce") or PAYS the check and then charges the customer's account a fee of as much as $31. This fee is usually called a "nonsufficient funds fee" or an "insufficient funds fee" and is levied on the customer's account within a matter of hours by internal electronic transfer, customer to bank. Usually this fee is charged instantly by computer algorithms set up to debit any account if certain parameters develop. Often this happens after banking hours or during the night and with increased frequency in the late- or wee-hours between Tuesday and Wednesday morning. These particulars, of course, vary from bank to bank and state to state. Many times the customer is TOTALLY INNOCENT yet gets charged by this robotic, computer-driven system regardless. For instance, if someone gives you a check that is "bad" (i.e., a check not covered by funds in the maker's account) and you deposit it and write other checks against it on good faith -- all the other checks you write will bounce. This is due to no fault of your own, yet you will get charged as much as $31 for each bounce. Even though the law requires the bank to "immediately" give notice to the customer that a check has "bounced," it does NOT require that the bank must debit the customer's account a fee at the time the deficiency shows up or notice is given. The fee can be debited at any time and this is "arbitrarily" left up to the bank's policy board. But, as you will see below, by fine-tuning this socially repugnant business practice, the Federal Reserve Member Banks (your bank, in other words), generates enormous profits at your expense and, in all likelihood, because of your reluctance to complain due to embarrassment. When the bank charges a bounce fee, this charge immediately reduces the balance in your account. This usually causes other checks in your account to bounce, especially if a) your balance is low, b) the check that made your account over-drawn ("Offending Check") is paid by the bank or c) the Offending Check amount is higher than other checks that might be outstanding in your account. Even a check for $1 will now bounce because the bank has instructed its computers to debit your account (in the middle of the night) a fee for as much as $31 for each Offending Check. If you have many small-denomination checks outstanding, these will ALL also bounce. Then each of these new bounces -- bounces that could be said to be caused by the bank at this point -- incur additional $31 charges against your account, draining further funds or placing it in debt (i.e., over drawn status). This banking practice sets up what's known in science as a negative feedback loop. Such a "vicious cycle" can easily cost you fees of $62, $93, $155 or $310 before you even receive notice in the mail that there is ANY problem with your account! It's not long before you may be beyond outrage and/or totally confused as to what your account balance is. At this point you are often unable to render a normal bookkeeping or interim reconciliation of your account to get things back on track (or assign responsibility). Thus, the only stop-gap "remedy" for the escalating situation is for you to rush out and get a bunch of cash and deposit it into your account immediately. This "forced-deposit" necessitates drawing money from another account, liquidating an asset, raiding the mattress, borrowing from a hostile (but possibly richer) family member/friend, kiting checks or just saying to hell with the account and letting it go down the tubes. If one chooses the latter, they will suffer the bullet of one more debt and a blotch on one of the many bank-serving credit reporting agencies (such TRW, Trans Union or Equifax) that are always circling like vultures(3). What's worse, you may be placed on the bank's "fraud list" and as a result of being on this list, you will be unable to open another checking account anywhere. Thus your ability to operate in modern economic society is truncated to that of cash 'n carry and money orders. You're a second class citizen now. The sum of $62 (an insufficient funds fee charged from just two bounced checks) can mean a week of food money for someone who is unemployed, a senior citizen on a fixed-income, or a youngster just out of college who is still becoming familiar with the financial planning required in day-to-day life. Such people, especially the elder, often have difficulty keeping, or reconciling, a check register under normal conditions -- let alone under the conditions generated in the nightmare of insufficient funds inflicted by banks. The upshot of the above economic litany is the CUSTOMER and the BANK are involved in extensive amounts of time to reconcile the account (and argue) -- time which can easily amount to hours over the course of a day or several. The customer usually has to take time out of their work (as banks are only open for a small window of time each workday) and undergo extraordinary measures to remedy the situation, all of which cuts into his or her responsibilities, familial and at-the-job. THIS CAUSES DAMAGE TO SOCIETY BECAUSE IT FORCES PEOPLE TO WITHDRAW THEIR ATTENTION FROM THEIR VALID WORK AND PLACE IT ON BANK-GENERATED NONSENCE. It preempts people's time to handle a situation that is self-serving for the banks. Any way you slice it, this system is a terrible inconvenience, if not an unscrupulous racket for the Federal Reserve Member Banks. When you consider that this racket is being imposed on thousands, if not millions, of people all over the U.S. and World in any given day, imagine what the forced-deposits (see step 4 above) and automatic-fees represent in monetary terms to the banks. One of my bankers, who is an honest person from India (and who shall remain un-named least he risk being fired), told me the following: "The banks exploit the NSF profit center knowingly and with a high degree of precision. For them it amounts to a profit of about $18 billion per year and it's without question at the customer's expense. Either the banks get money out of you from the bounced checks or they force you to borrow with over draft protection. What they are doing is basically what the mob does, selling protection from themselves." Again, this system is not only bad because the customer loses time and money; the customer's business connections lose time and money, the business world loses time and money and, in the end, the society loses over the waste of human resources. What's worse, the bounce-check system has been engineered by bank managements and owners to be a covert profit center. Unfortunately this profit center exploits basically honest people, many who are just trying to survive or who are often too embarrassed to admit that they have "bounced a check" (as a bounced check is often taken as a symbol of being either low on money or financially irresponsible). Thus few raise the matter and the banks continue exploiting people and society with their nefarious little profit scheme, one scheme among many as reported in a book entitled The Creature From Jekyll Island by G. Edward Griffin. When the Bank debits its customer's account an insufficient funds fee it is usually 2 to 4 days before the customer becomes aware (by mail) that say $31 has been debited from his or her account. On 21 January check #6605 for the sum of $8.25 was presented to the BANK for payment. Even though the BANK has in its possession the sum of at least $60.17 cash, they considered the $60.00 as "unavailable or uncollected funds" and thus charged this account a fee of $31.00. All this happened between Tuesday and Wednesday morning (January 21 and 22, 2003) however, the UNAVAILABLE/UNCOLLECTED FUNDS NOTICE, having been mailed, was not even received by the customer until Saturday, 25 January 2003 -- and the only reason it was not received later was because the customer just happened to be in the office on Saturday, otherwise it would not have been received until Monday, 27 January 2003 -- 6 days later! Thus, what in essence is happening here is the BANK is charging the sum of $31.00 to a customer for paying an $8.25 check even though they have at least $60.00 of the customer's cash on hold from Monday the 18th of January, THRU Monday, the 20th of January (a holiday) and into Tuesday the 21st of January. The BANK'S computers and policy seem to be QUICK to debit and SLOW to credit. Thus increased fees are generated at the expense of the customer. First of all, banks should not pay checks when there are insufficient funds in an account, thus the bank would be protected from any loss of that nature. Secondly, insufficient funds charges should not be levied until after the customer has had reasonable time to have received notice or they should be assessed when the customer's monthly statement is cut along with all other service charges -- not in the middle of the night between Tuesday and Wednesday by computer drones. The Bank that is charging a standard service or activity fee for managing the customer's account is in essence "double dipping" when it also charges a $31 fee to administer the handling of insufficient fund situations because this fee is excessive in light of the service rendered and the bank does not state that this fee is punitive. The fact that the bank debits a customer's account a $31 fee before the customer even knows about the debit, indicates that the bank assumes its accounting is correct and the customer's accounting is in error. The agreement between the bank and the customer cannot absolve the bank for its errors or policies contrary to law or public opinion, especially when the bank is acting in a fiduciary capacity. Accordingly, a customer cannot waive their rights, and the bank cannot expect that a right is waived, by placing a deposit agreement between the bank and the customer that is fundamentally fraudulent, usurious or against public policy. If the bank's accounting turns out to be in error and the customer's accounting correct, it could be construed that the bank has in effect embezzled money from the customer because the following elements exist: there is an employee, agency or fiduciary relationship between the bank and the customer; the customer's money came into possession of the bank by virtue of that relationship and the customer's money was intentionally and fraudulently appropriated by the bank causing damages (as delineated above). The reason I say "fraudulently appropriated" is because one of the strongest elements of fraud is the intention to deceive. Because of various ABA meetings that are public record, it is evident that senior management of banks are well aware of this bounced check fee practice and have expressly intended for it to be a profit center. In fact, at least one bank has acted to bolster its profits by such despicable practices as processing larger-denomination checks first so that the likelihood greater quantities of smaller-denomination checks will bounce. The fact that the customer's account is thrown into an accounting uncertainty by fee withdrawals (unauthorized from the customer in real time), places the bank at an advantage and the customer at a disadvantage such that the customer can easily be deceived by the bank (knowingly or unknowingly) as to the status of his or her balance. This set of circumstances thus brings about a financial gain for the bank and a financial loss for the customer. Many customers pay the excessive bounce fee(s) in ignorance or under duress. This occurs when they assume the bank, due to its institutional status and/or superior computerized bookkeeping system, will usually be correct when in fact they are in error, or the element of embarrassment causes duress, so they just pay up and shut up. Under such circumstances the contractual relationship between the bank and the depositor takes on the nature of a contract of adhesion. Banks should take a serious look at their policies as they relate to the handling of insufficient funds and if what I have discussed here makes sense to them on a broader social level, or if it can improve customer relations, they should change this negative feedback loop as soon as possible. Unfortunately, in all probability banks will not change their policies because of the significant sums they are making -- a similar situation, albeit on a smaller scale, to the tobacco companies when they refused to respond to public concern on their exploitive activities. As evidence of this claim, I sent a letter to Eugene Ludwig, then Controller of the U.S. Currency, outlining the above points around 1995. 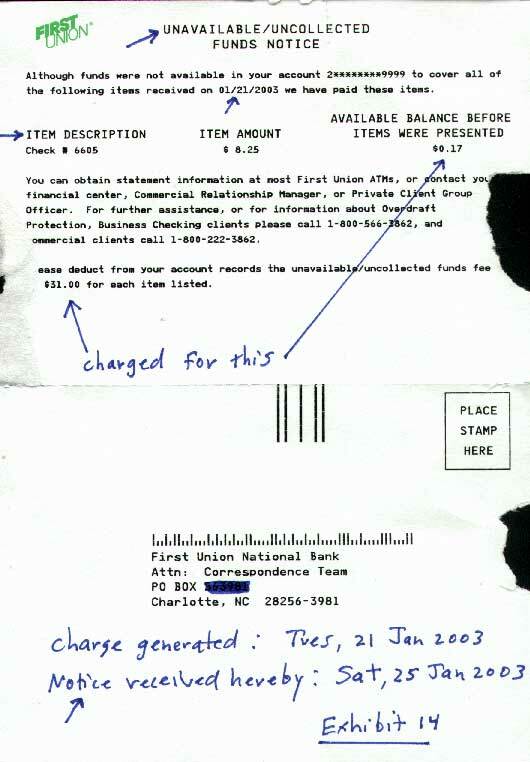 At that time insufficient funds fees were generally about $20 as opposed to the $31 (and higher) many banks are charging now in 2003. Not only did I receive zero response from Mr. Ludwig, but it appears that the situation has become worse. Not only are more excessive fees being charged for "insufficient funds," but now the banks have added a new way of "justifying" such fees: they have added the game of "unavailable funds" and "uncollected funds" to their arsenal of tricks. This means that they can not only charge you a $31 "insufficient funds" fee if your account is OVERDRAWN, but they can charge you an "unavailable funds" or "uncollected funds" fee if your account only has UNCOLLECTED funds -- meaning funds that have not yet been credited to your account through the banking system -- an action that is entirely out of your control as the customer. Thus the only remedy for this situation will probably the class action law suit. Surely there are millions of people who, at one time or another, have been victimized and outraged by this system but have never mentioned it to anyone. Until this negative banking practice is removed from society, perhaps the only thing one can do is remove their money from their bank and deposit it in a credit union with more reasonable policies. (1) This discussion does not address the Federal Reserve System in general and as discussed in such books as The Creature From Jekyll Island by G. Edward Griffin. (2) Often the bank service representative will reverse a certain amount of "bounced check" charges or "negotiate" with the customer as to what portion of them can be reversed. This is a nice gesture, but often to arrive at this point, much time is absorbed by both the representative and the customer. In the end, the customer still ends up paying an excessive fee because the fees are so excessive to begin with. (3) The credit card reporting agencies actually serve the banks under the guise of serving the public. Since most of the money the Federal Reserve bank issues is generated out of thin air from monetizing debt or fractional reserve, the banks lose little or nothing when a depositor defaults. (See http://www.jaegerresearchinstitute.org/articles/money.htm for more information). Thus the credit card reporting agents are protecting nothing. What they ARE protecting is profits. They do this by creating a financial dossier on you (similar to, but not as extensive as the dosiers that were used in Nazi Germany) so that the banks are in a better position to use this information to extort higher interests rates and points out of you. To the degree the banks have adverse "credit reports" at their disposal, their sales force (known as "loan officers") has the "justification" to charge you higher rates and points for your home mortgage and consumer credit. The loan officers explain that these higher fees are needed "because they are taking more risk" on lending you the money they have created out of nothing.